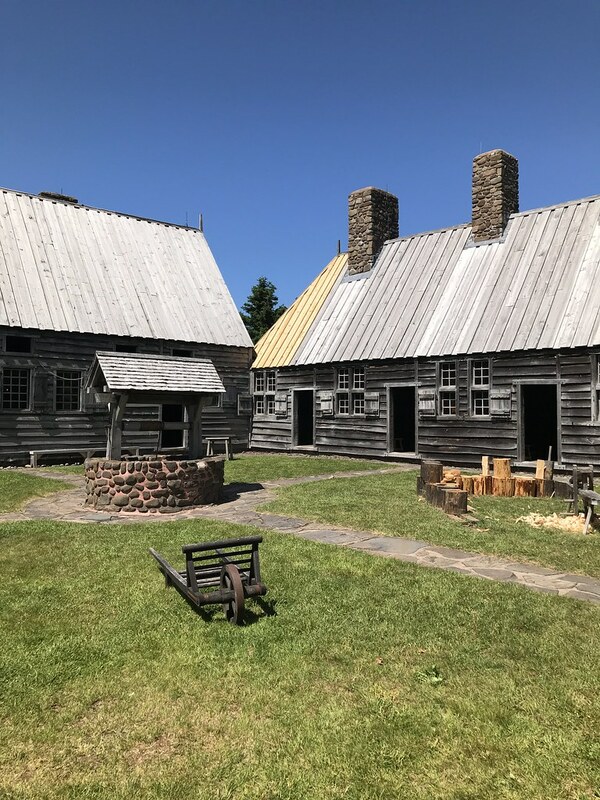 Port-Royal, a National Historic Site, and a member of the Parks Canada network opened its doors for the season a few weeks ago. I was lucky enough to visit on a warm, sunny, cloud-free afternoon. Welcome to week 373 (6/21/2018) of Travel Photo Thursday. Join me as I take you on a photo tour of my favourite rooms and spots at Port Royal. In 1603 King Henri IV of France granted Pierre Dugua, Sieur de Mons, a fur trade monopoly for a large area in North America on the condition that he establish colonies there. In 1604, Sieur de Mons led a settlement to Saint Croix Island in the Saint Croix River between Maine and New Brunswick. A severe winter and lack of provisions led to the death of almost half of the colonists. In the spring of 1605, accompanied by explorer Samuel de Champlain, de Mons undertook a voyage south to find a better location. 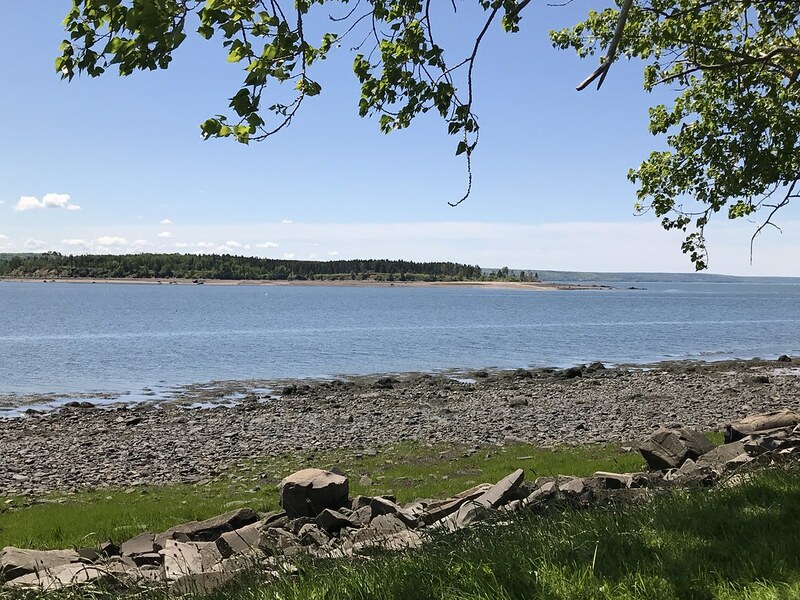 On Champlain’s recommendation, they settled at the beautiful, sheltered harbour of Port-Royal. It was here they started to build their new settlement. Skilled craftsmen assembled the structure by hand. Before winter arrived, the French were residing inside a finished compound that offered protection against the wind and cold of winter. 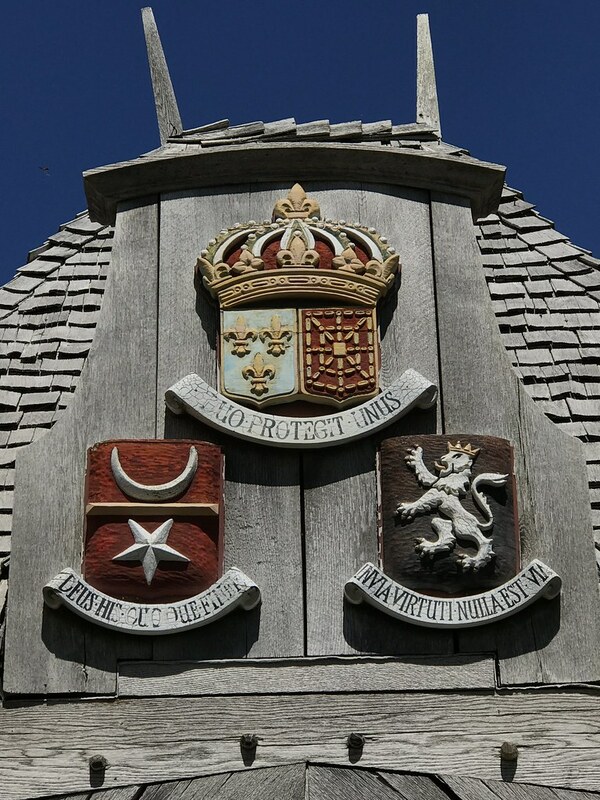 You enter the compound through this single wooden door with the crests above the doorway. This is the storeroom, where furs were stored prior to being shipped to France. 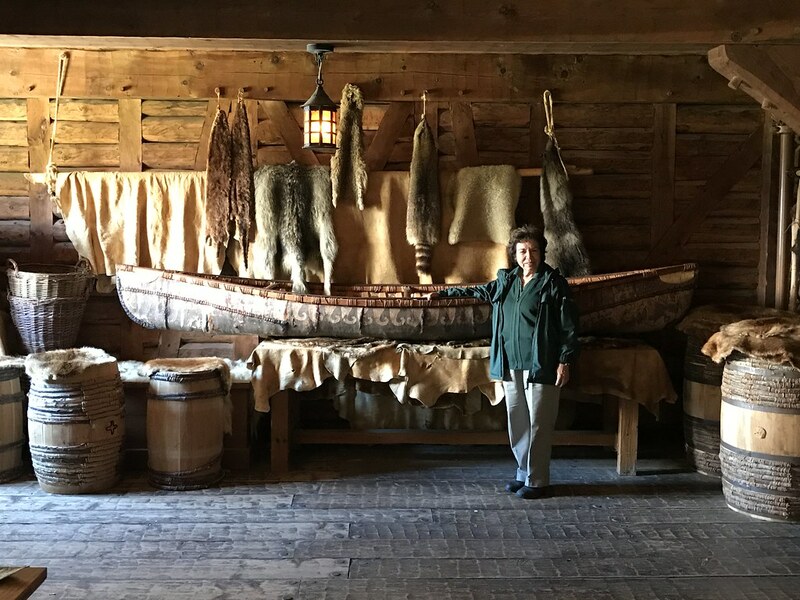 The lady standing in front of the handcrafted canoe is one of the park guides and is a member of the Mi’kmaq tribe. From the Parks Canada Port Royal Visitors Guide: Did you know? 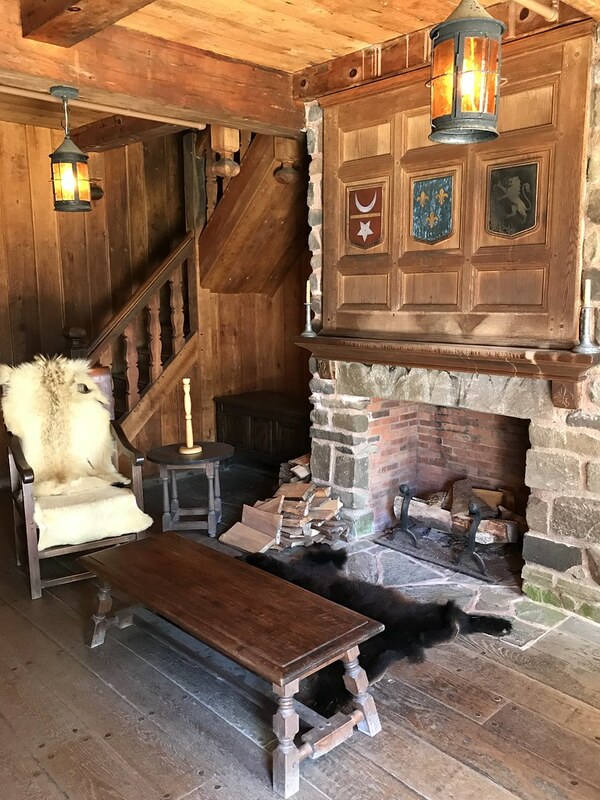 The Governor of Port Royal lived in comfortable elegance. Can you imagine him stretching his legs in front of the day after a long day of habitation business? I was surprised to see such a well-organized pharmacy of traditional herbs. 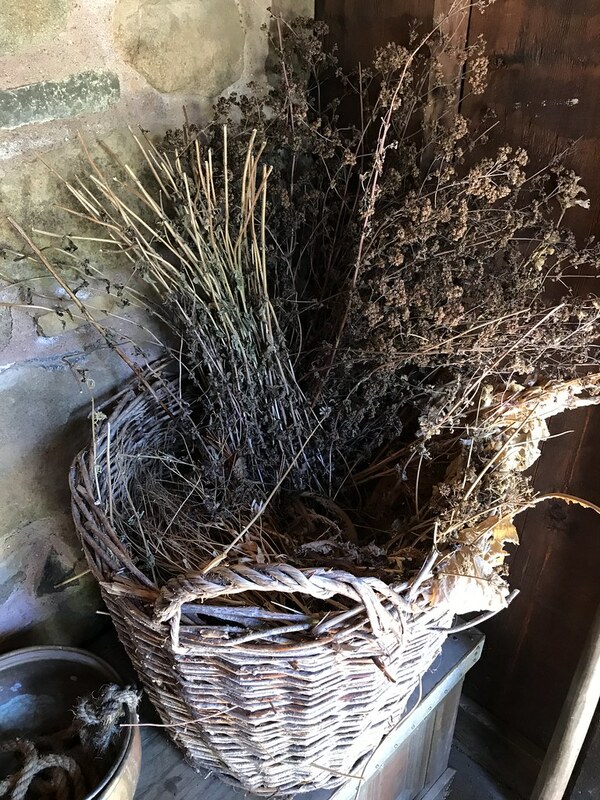 I think the Mi’kmaq would have shared much of their knowledge of the various herbs. The Mi’kmaq had welcomed the French when they arrived, forming strong friendships and alliances. Meals were communal, and from the looks of the tables and the dishes, etc. it appears the mealtime would have been an important part of their day. 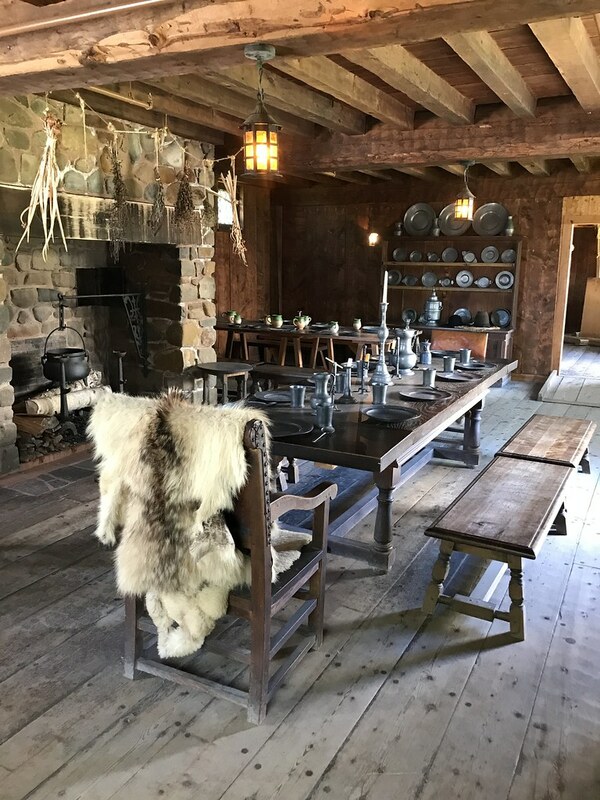 This is the dining room where “The Order of Good Cheer”, established by Champlain, entertained important members of the colony with a banquet of food and entertainment. In the courtyard of Port Royal, you have the well and this is where the settlers would chop wood and other woodworking tasks. Winters were harsh, so they wouldn’t want to travel far for water. 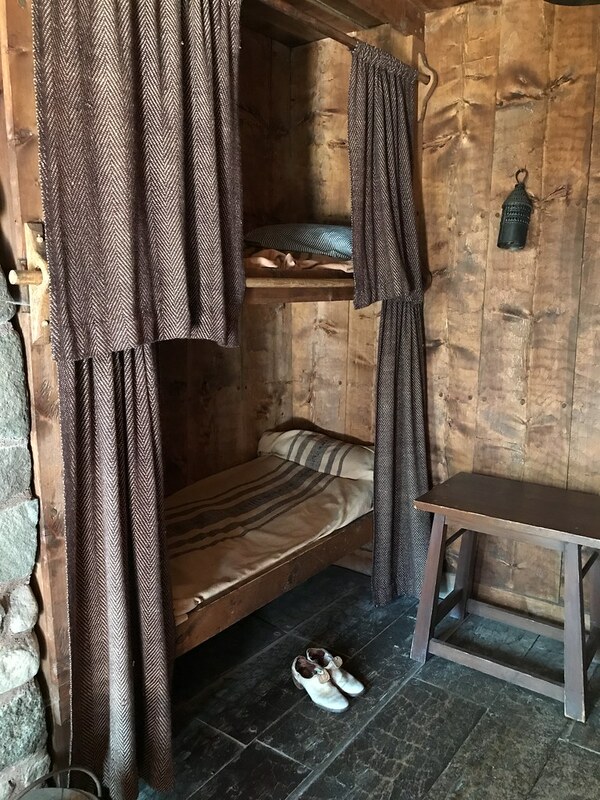 The sleeping quarters look comfy (for the 1660’s!). It seems they valued a bit of privacy when sleeping. Back in the day when I stayed in dorm-style hostels, I don’t remember having this much privacy in any sleeping dorm! After visiting the compound head towards the basin to enjoy the views. 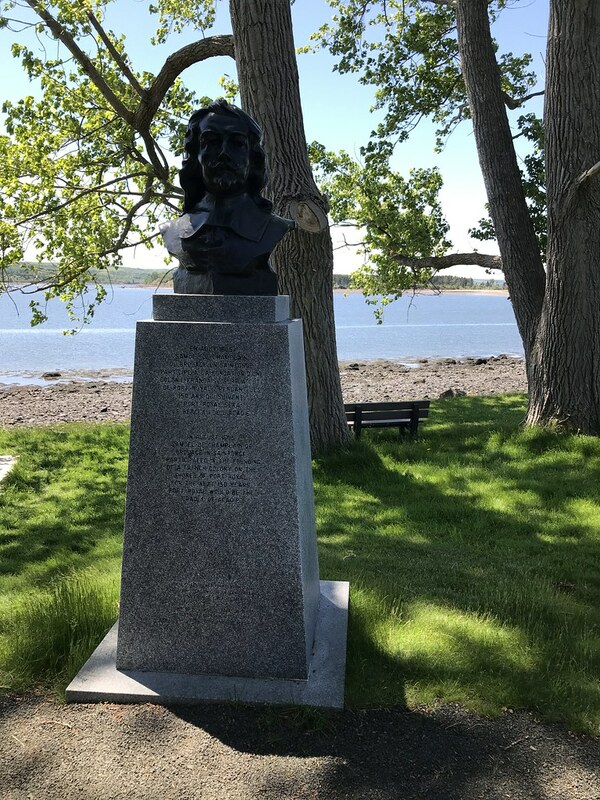 You’ll pass this bust of Samuel de Champlain. Have you visited Port-Royal? Let us know in the comments. I love visiting restored historic places like these. It really gives a sense of how they lived back then. Glad you had such a great day to explore this site. The governor certainly lived well. Hi Mary. I thought the exact same thing. I hadn’t expected anything quite so grand for the 1600s. What a great place to photograph! The fort is so evocative, even if I wonder about the accuracy of these recreations done in the 1920s and 1930s. We have some of those here too, as there was a lot of Romanticism about the past during that period. 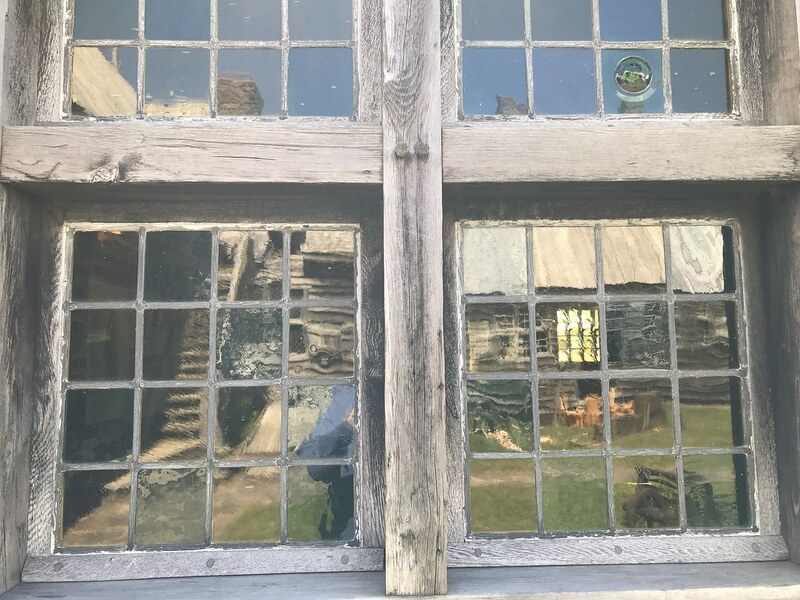 At least here (and in Sweden), a lot of things were made to look a lot more charming than they actually were, so I’m guessing the governor of Port Royal maybe didn’t live quite so well! But it’s a beautiful site and one that would be a of fun to visit. Hi Cindy. There are a lot of photo opportunities here. You’re probably right about the conditions being presented may appear nicer than they actually were. However, Port Royal was rebuilt using Champlain’s original plans. What an interesting, historic place! Hi Erika. 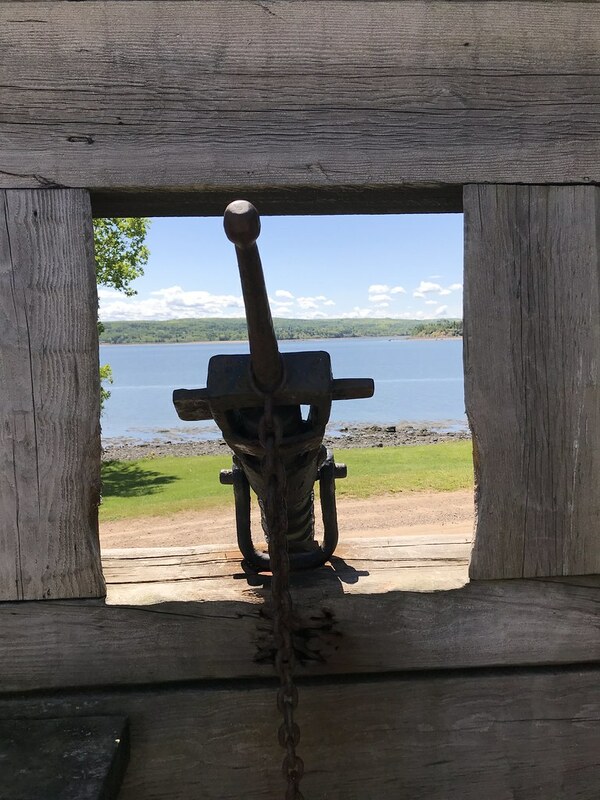 Yes, Port Royal is a must visit for anyone visiting Annapolis Royal. What a fascinating place! Looks like a movie ste straight out of Game of Thrones! 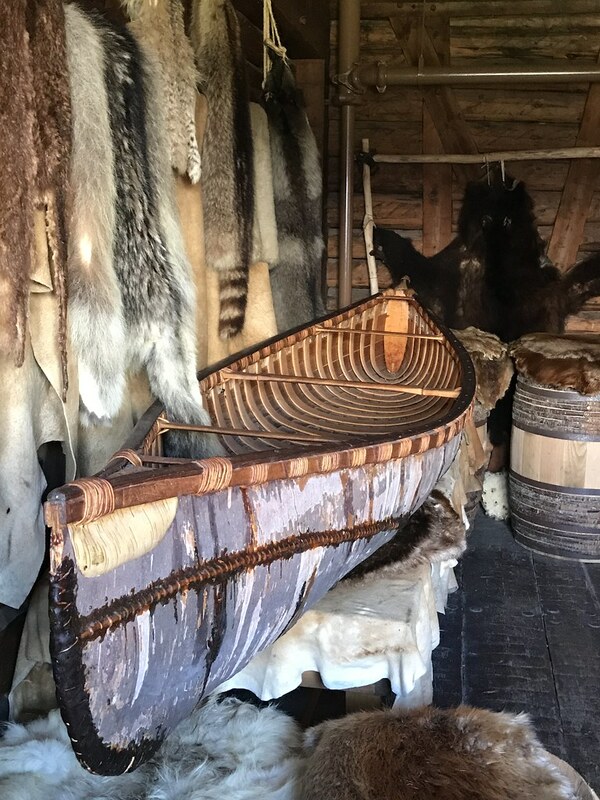 Love the fur room and the handmade canoe. Everything in that space looked stunning. Also love how the fur is draped over the dining chair in the dining room. Really looks like that’s how it was back in the day. Hi Amy. The fur room was one of my favourite rooms, too. What a great place! I really felt transported to the time of the fur trade. The site has so many interesting details. It would be nice to visit. I have always enjoyed history but I think watching historical series (there are many on Netflix, etc) has ignited more that passion. Hi Ruth. I’ve enjoyed history since my school days. Netflix does have some great historical series. Sounds like an interesting place to visit. Thanks for sharing your experience as well as the details; such as opening times and prices. For some reason the designs and badges remind me a little of Harry Potter. Do you get that feeling too? Hi Katie. I agree they do look like something you would see in a Harry Potter movie. Hi Eli. Believe it or not, the rebuilding of Port Royal was done with Champlain’s original plans. It’s super interesting! I love visiting old places like these. And the port royal historic site really takes you back into another time with all the old buildings! Hi Verena. It’s like walking backwards in time. Wow so much history in one spot! And the photos are great!! It is cheap too so no excuses not to visit!! Hi Tif. It definitely ticks all the boxes for a must-visit tourist attraction. Gorgeous photos! I love visiting places with such a rich history. I try to visit a historical place on every vacation . . . I love to learn! Whenever I can finally convince my hubby to visit the maritime provinces, this will definitely be on the to-do list. Wow, this is so informative and picturesque at the same time. I love to see how people lived in the past, and this looks like the perfect tale. So many things to explore. I bet you had a good time! 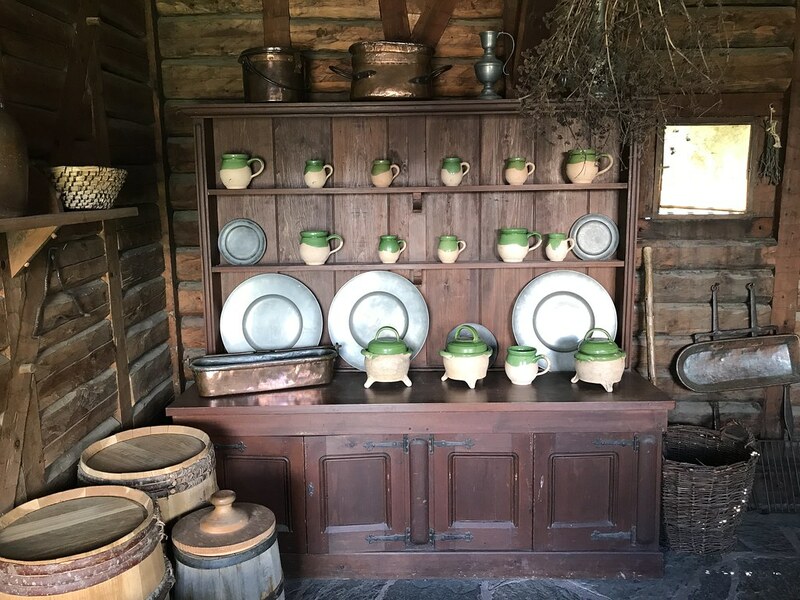 I love the artifacts in the site, the kitchen utensils, especially that green sets of mugs, really catch my attention. I would love to spend a whole afternoon to explore this gem. Interesting post! It’s very informative and a must visit historic site! I would love to visit this place someday! Visiting places like these is like taking a walk back in time. I would love to visit this place someday. Great display! 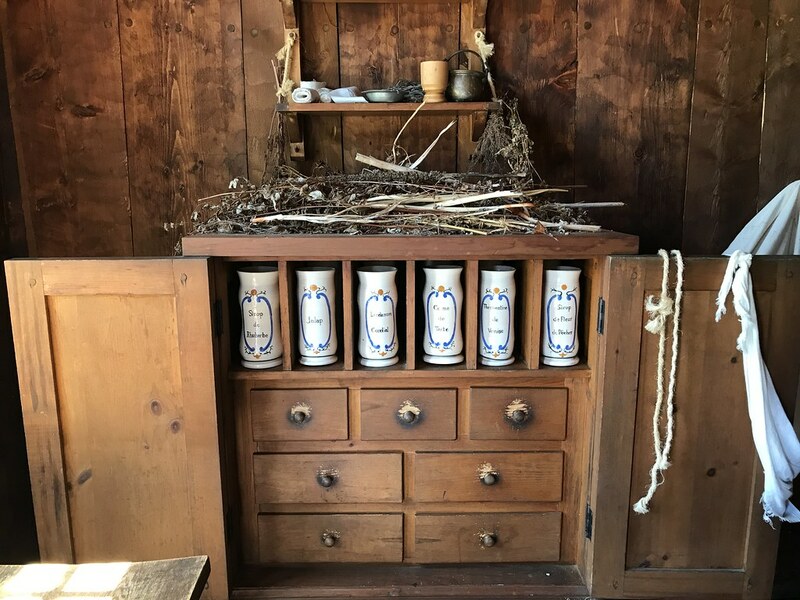 i love it when museums are organized to recreate life, not just a bunch of piled up objects you vaguely understand people used. Port Poyal have been so important back in days, it looks fantastic. Want to visit it! That is the ultimate “cabin” life. Thanks for sharing these photos. Looks like you had an amazing time. Wow looks so cool, I have always wanted to go to Nova Scotia, I will definitely be putting it on my list of places to travel! Amazing to see how well everything in this port has been restored and maintained. Sleeping quarters feels like a nice place to rest and the rest of the rooms are so peaceful. Hi Vidya. The restoration was well done, and the goal was to maintain the settlement’s authenticity. Historic sites like this are so much fun to visit. It is so hard to put ourselves in the peoples’ lives who lived during those days. What a lovely place to visit. I love visiting historic sites. This one looks full of character. This place looks so interesting and full of hisdtory. I love visiting historic landmarks and learning more about them. I’ll have to put this one on the list to see. Thanks for sharing! Hi Nicole. It’s one of the most historic places in Canada, and the scenery is also gorgeous. Do come and visit. Love visiting historical sites. Great photos! Isn’t it amazing to visit places that are dripping in so much history. I love finding out about places like this. It looks like you had a lovely time. Nova Scotia is such a beautiful looking place! I’ve allllways wanted to go and have never found the time – this is inspiring me to get my act together and just do it! Beautiful pictures. I love learning about historic landmarks and the history of other places. Being from Louisiana there is so much history everywhere you turn. Port Royal looks like a gorgeous vacation destination! I’d love to visit one day. The place really takes you back in time! You’re so lucky to witness something this awesome, thank you for sharing your experience. I would love a trip up there. I have always loved the Nordic culture. I feel the history buff of my youth is returning with a vengeance. This afternoon I visited a Heritage Village in the city I’m visiting and now reading this. In today’s world of ease it’s a good reminder that these comforts we enjoy are a privilege. Running water, flushing toilets, electricity, refrigeration. What an exquisite place! I love when historical locations are set up to mimic the feel of the time and setting when they were in their prime. A picture is worth a thousand words and places like this are almost like getting to walk through a portrait of that time period! What a great way to learn about history. When you can really picture what life was like for people, it becomes real..
Beautiful pictures! Historic places are very fascinating, and visiting this places are truly worth it. What a fun and historic place to visit and Photograph! I am just in love with the architecture! I love this type of historical site. I always learn so much as do my children. I think it is a great way to spend the day. This was such an interesting history lesson. It’s impressive to imagine how people used to live in the past and how they would manage with the basics. I love the banquet hall! Hi Joanna. The banquet hall is one of my favourite rooms, too. The name Port Royal reminds of Pirates of the Caribbean…  Looks like an amazing place to go and visit! Putting this on my bucket list. Hi Maartje. It is an interesting destination. There are many other things to do and see in the area as well. Looks like such a cool place to visit. I’m always amazed at the differences in ways of living between countries, cultures and even generations. That’s a place my kids would enjoy visiting. The fur room would definitely be the one they would be most curious about. I love the authenticity of this place. We have a place called Landis Valley Farms but a lot of it is roped off so you while you can look you can’t get very close to anything. What an amazing place to visit! It really brings history to life when you can walk in the footsteps of the people we’ve learned about in school. The history books don’t share how gorgeous it is though. Wow, this looks really cool! I’ve always wanted to visit Nova Scotia — it’s a doable trip since I’m in New England. I know my mom has always wanted to go too, so hopefully we can plan a trip someday! This looks like such an interesting place to visit. I love to visit historical places like this. My kids would love those bunk beds! I like how such historic places are maintained and makes our visits memorable. The pharmacy is so well organized. 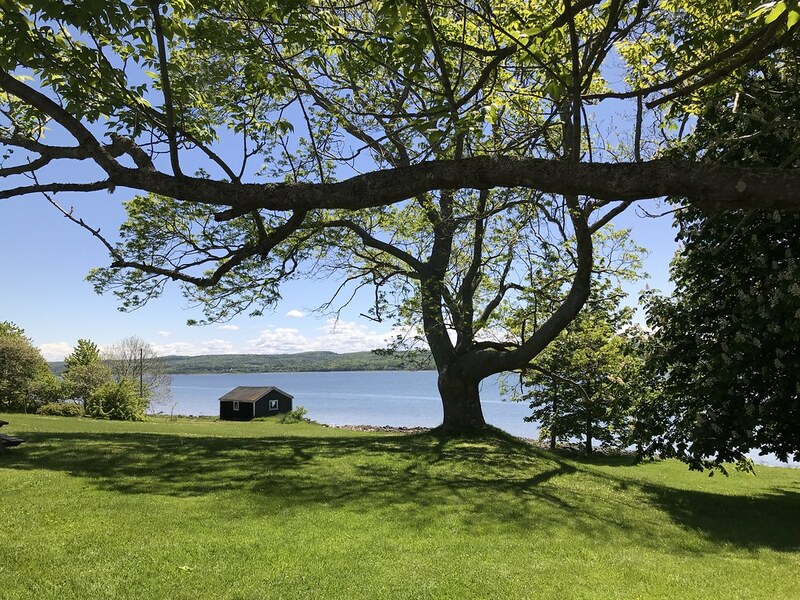 The views of the Annapolis Basin seems worthwhile… great views. This place looks amazing and so unique! I love finding new and historical places to go to. I’d love to take photos here too! I love that it has so much history. This would be a great educational place to visit. Plus the entry prices aren’t expensive so it works for all budgets. I always love visiting historic places like this. They just connect you to another world, help understand where the word comes from and where it really goes. I am not much of a traveler but my daughters love to travel the world. They fully appreciate historic sites and could be interested in visiting here. Gorgeous pictures! I haven’t been to Port Royal but I want to recommend this to my mom. She loves historical sites. Wow! What an interesting place, surely a lot of history and knowledge are on these. I love visiting place where you can learn so much about the past and culture. I have never been to Nova Scotia but I always wanted to visit. Such a wonderful place. Will be saving this! Next trip to here. What a beautiful spot to visit! I love learning about the history of the different settlements. I grew up in California and we often visited in the Catholic Missions. So interesting! Wow! What a fascinating site with interesting history! Being a history buff, I would love to visit this amazing place. Looks like a great step back in time. The communal meal area looks right out of a fairy tale series we used to watch as kids! All the old world harm is so well preserved here. I have never been there but such a nice place to go and love learning other’s cultures and history. 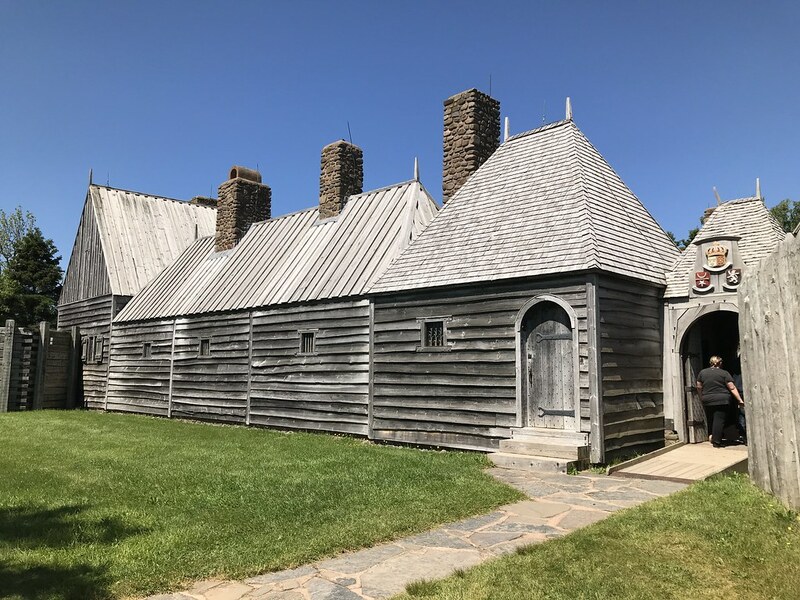 This is one of the places to visit if you are in Nova Scotia, and interested in learning about the province’s history. I just love a look back at history. I always have, every since I was a child. Such great photos and looks like a really great place to visit! Wow very informative! I would love to visit here someday! 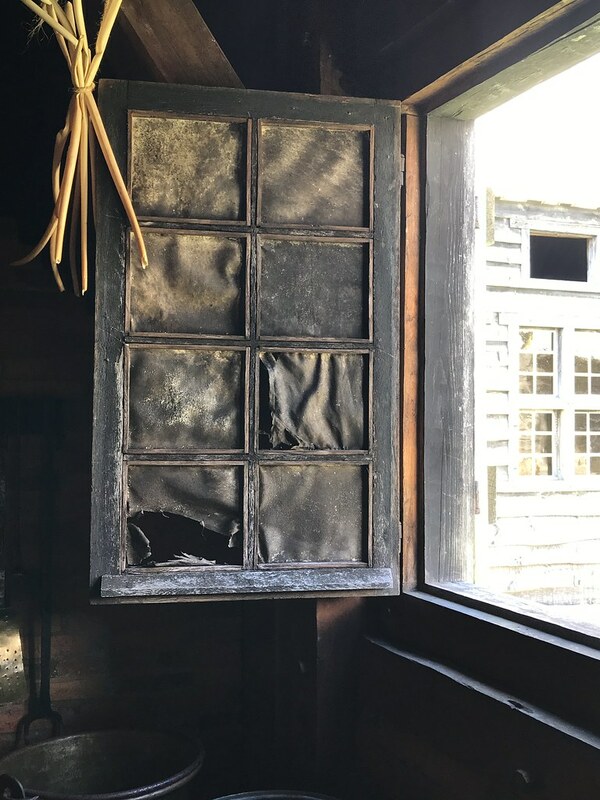 If you like to learn about the history of an area when you travel, Port Royal is the place to do that. The pictures are so amazing. You are a beautiful writer. The post was quite informational and interesting. I would have to look up travel Thursdays and try to contribute. I love all of your photos. It looks like such a cool, history-rich place to visit.